Engraving of a column taken from the Temple of Vis Visha at Benares by Thomas Medland (1755-1833) after William Hodges (1744-1797). Plate 8 of William Hodges 'Travels in India, during the years 1780, 1781, 1782, & 1783' published in London in 1793. Varanasi (Benares) was founded in the sixth century BC. It is situated on the west bank of the River Ganges and is one of the seven sacred cities of Hinduism. The area is known as a tirtha, or ‘crossing place’ which allows the devotee access to the divine and where gods and goddesses can come down to earth. 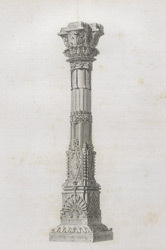 The Hindu column in this engraving has a square base, a shaft with polygonal sides and decorations such as the bell and chain motif.